Fungus on Cucumber and Zuccinni I appear to have a fungus on my cucumber plants. What can I do to cure this? Are there any cures or organic remedies? I moved my Hollyhocks to a part of my garden where they would get more water on a regular basis. They have so far done well and are bigger and fuller then they ever were. But, about two weeks ago I noticed something appeared to be nesting on the underside of the leaves. There were hundreds on each leave- about the size of a pinhead and rust in color. 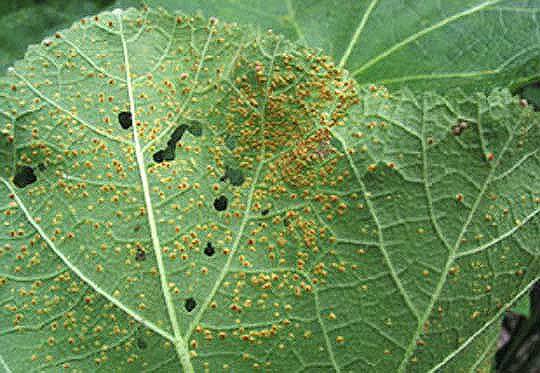 They do not appear to be any of the typical Hollyhock diseases. I cut off each infested leave and threw it in the garbage. The interesting part is I have tons of other perennials in the same area and none of them are affected- just my hollyhocks. There are other plants in between my hollyhocks and they are fine- whatever it is simply liked the hollyhocks. By the sounds of things, your place of residence being "NorthWest' must mean USA - e.g. summer while we are in winter here in Australia. However it sounds (and looks) very much like 'Rust" being a sort of fungal disease which is quite common, but can be quite selective on which plants it chooses to affect. There will be local alternatives available in your corner of the USA. Rusty Scale on Apricots As a beginner to gardening I am living on a 5 acre property with an orchard of 33 trees. There are four apricot trees and all are under stress from lack of water and neglect. The fruit has a rusty coloured, hard scale on the skin and the fruit is very small. What is causing it and how can I bring the trees back to health. They also need pruning as it has not been done for some years.